Thanks for pushing play! Here's an unboxing (unbagging) of TeeBlox, monthly geek gears box! 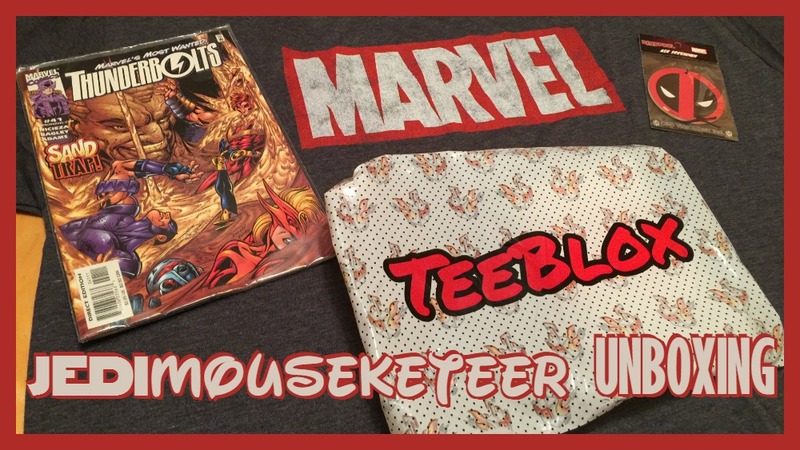 This month we feature a MARVEL COMICS themed TeeBlox. Be sure to use our referral code or links below to subscribe to TeeBlox and take advantage of these Blox! Jedi Mouseketeer referral link to share on Facebook, Twitter, Instagram... or anywhere and SAVE 24% on your first month's subscription! When you subscribe to TeeBlox, you can choose several different tracks: Movies/TV, Comics, Drinks and Mix. They deliver BEST QUALITY official licensed shirt and gear to your doorstep while striving to bring the best possible experience. They also have a RISK-FREE satisfaction guaranteed policy. Check out the cool stuff I received this month! Check out my podcasts on iTunes and Stitcher Radio!